Africa is made up of 54 different countries, and each country has countless different languages, tribes, and cultures within themselves. While the entire continent shares some basic similarities in terms of culture, no other place on earth has so much versatility and diversity than Africa. Let’s take a look at some of the most important aspects of a few of the different countries of Africa and what makes them stand out from their neighbors. The countries we’ll focus on include Ghana, Kenya, South Africa, Cameroon, Ethiopia, Egypt, and Morocco. Of the seven countries we’re focusing on, only four claim English as an official language, but three of those countries (Kenya, South Africa, and Cameroon) have at least one additional official language. Multilingualism is something that is regarded as very important in many African countries, particularly in South Africa and Morocco, where most residents speak at least two languages fluently, if not more. Many believe that multilingualism is the key to proper development and success as a country, so children are taught multiple languages from a young age in many places. Additionally, many other African cultures almost require multilingualism. It is expected for individuals (particularly those in rural areas) to speak a tribal language, as well as a national language and another foreign language (such as English or French) to be able to communicate with those outside their home communities. The most significant fact about languages in these seven African countries is the sheer number of languages present in each country. Without a doubt, Africans are some of the most linguistically diverse people in the entire world. They value multilingualism and honor their cultures by maintaining tribal languages, while also keeping up with the demands of the outside world by knowing English, French, or another widely spoken world language. Several of these countries also celebrate various Islamic and Christian holidays, though they are not country-specific. Everyone knows that Africa is bursting at the seams with culture. These seven African countries are no exception, as they each have country-specific cultural events that help them rejoice in their diversity, their heritage, and their country. Morocco is well known for its musical stylings, so they have countless celebrations related to music. The Essauoira Gnawa and World Music Festival and June and the Marrakech Popular Arts Festival in July are world renown for the music and performances that can be experienced at each. Egypt is well known for its influence in the motion picture industry, and the Cairo Film Festival is a great way to celebrate their presence in the world of movies. Many of Ethiopia’s cultural events are rooted in religious practices and beliefs, such as the baptism of Jesus, the discovery of the true cross, and a tribal pilgrimage event. Cameroon has a variety of festivals, including ones that celebrate regional music, commemorate resistance movements, and showcase the art and culture of a people group. South Africa hosts the largest annual celebration of the arts in all of Africa each summer, attracting residents and tourists from all over Africa and the world. Kenya has some of the most unique cultural events, including a camel derby, an international book fair, a carnival complete with parades and cultural celebrations, and a vehicle beauty contest. Last but not least, Ghana celebrates overcoming adversity with their Hogbetsotso Festival (celebrates escape from an oppressive rule), Homowo Festival (ridicules hunger and celebrates end of a famine), Aboakyir Festival (celebrates migration), and Panafest (celebrates Pan-Africanism). Cultural events are nothing new to African countries and residents, and there is something incredible going on during every month of the year in one or several African countries. 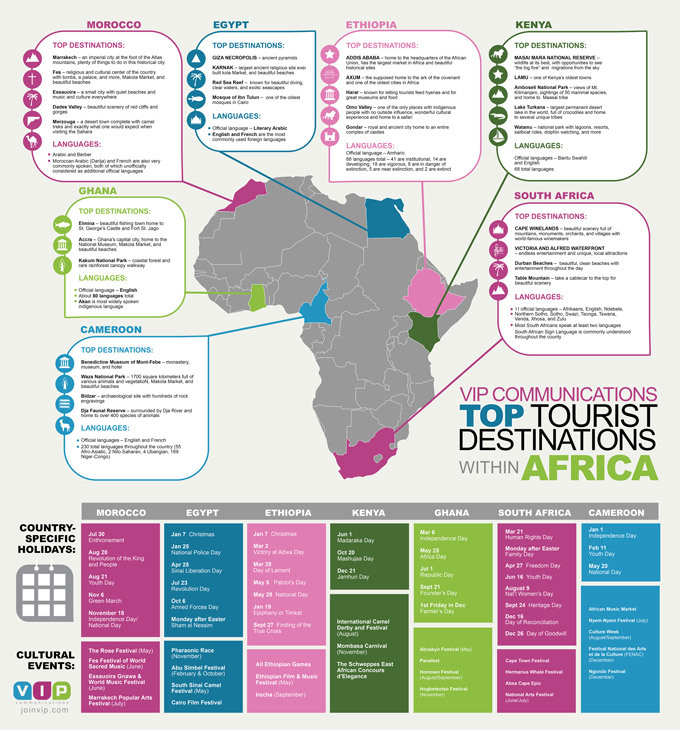 If you’re not familiar with any African countries, planning a trip can be overwhelming. Even if you’ve lived in Africa or have family there, knowing the best vacation destinations can be difficult. While each African country has its own form of beauty, each also has its own historical and cultural significance that can be seen by visiting certain areas. If you’re looking for museums and historical spots, consider the Cape Coast Castle in Ghana, the Gondar castle complex in Ethiopia, the Benedictine Museum of Mont-Febe in Cameroon, the Addis Ababa or the Axum in Ethiopia, the Giza Necropolis or Karnak in Egypt, or Marrakech or Fes in Morocco. If you’re searching for beautiful scenery, visit Dades Valley in Morocco, the Red Sea Reef in Egypt, Waza National Park in Cameroon, Cape Winelands or Table Mountain in South Africa, or Kakum National Park in Ghana. For bustling city life, check out Sun City Resort or Victoria and Alfred Waterfront in South Africa, as well as Douala in Cameroon. For a smaller town feel, be sure to pass through Mercouga or Essauoira in Morocco or Dahab in Egypt. For wildlife and safaris, make sure you visit Amboseli National Park, Watamu, or Masai Mara National Reserve in Kenya, in addition to Dja Faunal Reserve in Cameroon.